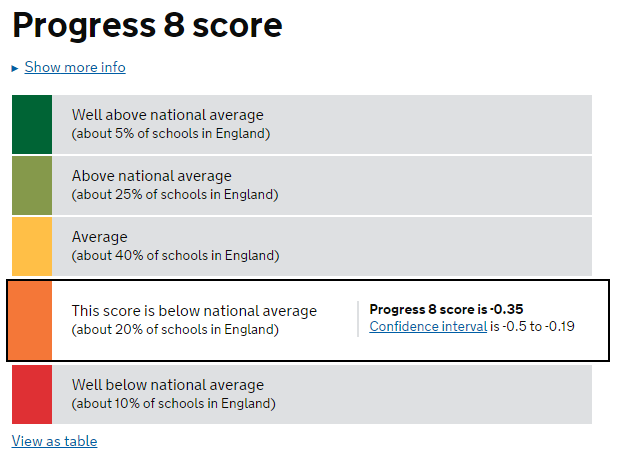 I have been a teacher for 29 years, a Headteacher for 14 years and, at the age of 53, this much I know about how Progress 8 might just be a proxy measure for poverty and EAL. It is worth pointing out the bleeding obvious. When we were inspected back in October, I failed to point out to the inspection team that our cohort is 95%+ White British, the sixth worst performing ethnic group in England at Key Stage 4 in 2017 in terms of progress (P8 score: -0.14). The five ethnic groups whose P8 score was worse than White British were: traveller of Irish heritage (-1.13); Gypsy/Roma (-0.80); white and black Caribbean (-0.33); black Caribbean (-0.23); Chinese unclassified (-0.41). 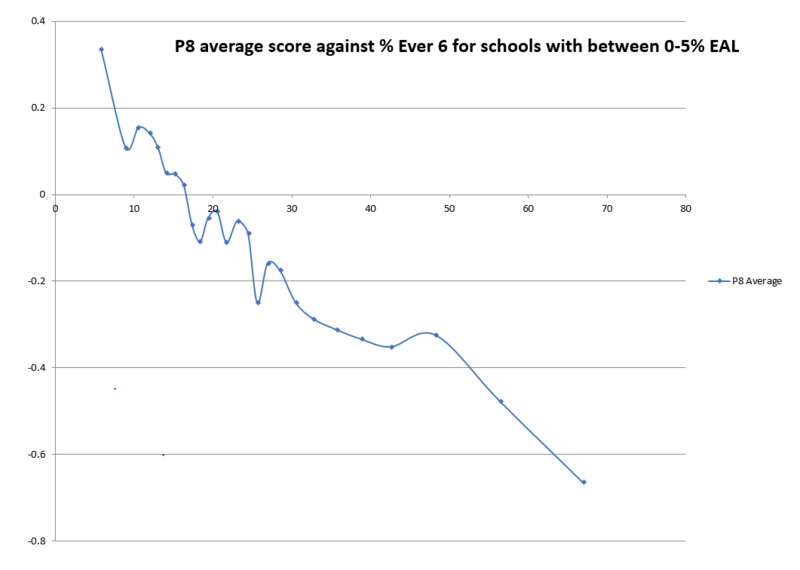 With the average P8 score for disadvantaged students being c. -0.4, then it is not hard to see that if your cohort is overwhelmingly White British and disadvantaged, then, according to the data, the challenge to secure a positive P8 score is huge. 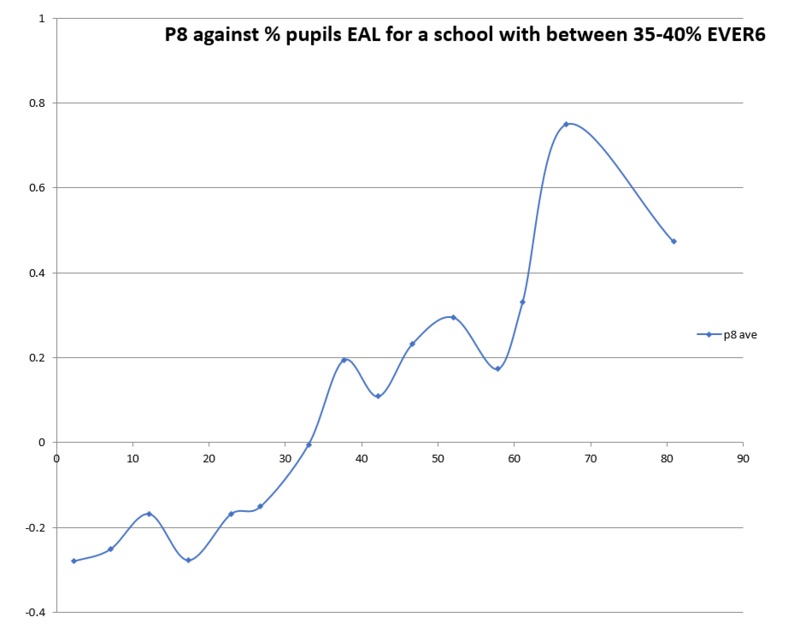 A school’s Progress 8 scores certainly measures its students’ academic progress; after looking at these two graphs, James Eldon and I wonder whether the Progress 8 score also measures the levels of poverty and EAL within a school’s student body.